You already know Transmit is a wonderful file transfer app, maybe even the best on any platform. It’s jammed with features, it’s fast, it supports every major cloud storage provider, and it looks awfully nice. But here’s something you might not know: the reasons we never put Transmit 5 in the App Store. They’re simple. We weren’t sure we could provide a good-enough Transmit experience under the stringent sandboxing security the App Store requires. And frankly, we weren’t sure Apple cared that much about the App Store on the Mac. Since then, a lot has changed. macOS Mojave gave us a significantly improved App Store that caters to professionals like yourself and seems to treat apps with respect. And sandboxing has evolved enough that Transmit can be nearly feature-parity with its non-sandboxed cousin. So, as we promised at WWDC: it was time to give this another go. Transmit from the Mac App Store is a subscription — just $24.99 a year. Included with your subscription is Transmit, access to Panic Sync, and any major Transmit updates that we may release in the future, all rolled into a convenient yearly charge. There’s even a free 7-day trial before your subscription kicks in. And, of course, you can cancel at any time. If you don’t like subscriptions, don’t worry! You can still buy Transmit 5 directly from us. It’s still $45. It will still include free minor updates. And you get the same support as a subscriber would. There’s a little something in it for us, too — a chance to learn about the subscription business and see how, if at all, it can impact our decisions moving forward. Wait, so I have to subscribe to Transmit now? No, my post-skimming friend, you don’t. 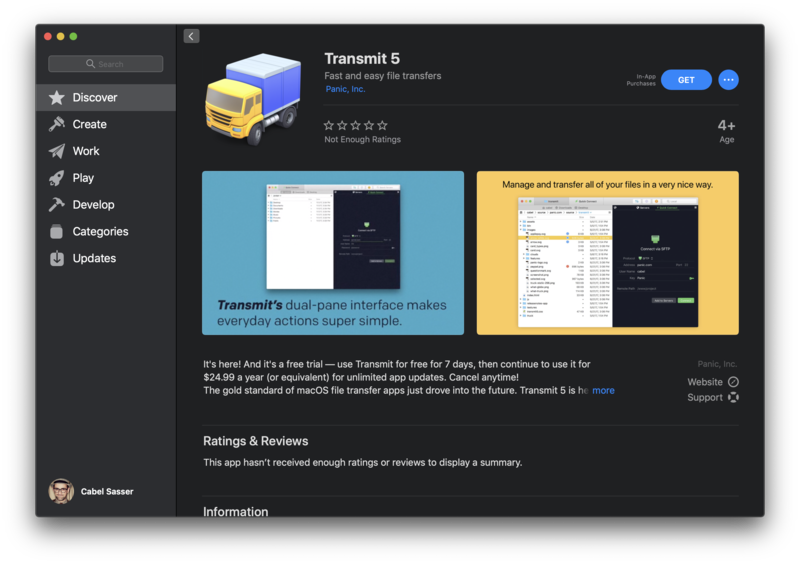 While Transmit in the App Store is a subscription, you can still buy Transmit 5 directly from us at full price and own it forever for just $45. Absolutely. When you install Transmit from the App Store, on first launch you’re given 7 days to use it as much as you want, without restriction, until the subscription kicks in, and you can cancel during the trial (here) if it doesn’t work for you. It’s really simple and should give you more than enough time to demo the app and make sure you love it. What’s included with the subscription? Transmit, Panic Sync, and frequent updates, of course. But you’ll also automatically get any major updates we release in the future as long as you remain subscribed. I already bought Transmit 5. Can I switch to the App Store version? If you bought Transmit 5 in the last 60 days, we can refund your purchase if you’d like to subscribe instead. Simply e-mail our support team. Beyond that, it’s gets really difficult, particularly as the prices are so different. Hey, what if I love the App Store but strongly dislike subscriptions? Yeah, that’s the one bummer zone in our plan — we’re sorry. But we believe the App Store is suited particularly well for subscriptions, and we’re always looking for a sustainable future building our complex applications. Yes, it does! With one small exception — “Open in Terminal” depends on AppleScripting the terminal, which isn’t possible with sandboxing (yet). But even viewing or editing or changing the permissions of files you don’t own is now possible, which wasn’t until very recently. It’s not in this initial release, but stay tuned. Any other differences in the App Store version? If my subscription lapses, do I lose my sites/favorites? Absolutely not. If you use Panic Sync, your sites are safely stored in our spacious, welcoming cloud, and you can sync them down in the future, even to non-subscription Transmit. And if you don’t use Panic Sync, as long as you don’t delete Transmit’s application support files, they’ll be there waiting for when you re-subscribe. Will Transmit 5 support iCloud for sync? We’re not planning to. We know it’s a bit of a bother to manage another account, but we really value the ability to debug syncing problems directly. What about Coda in the Mac App Store? Sadly, Coda cannot be sandboxed yet. We’re hopeful for the future. Oh and hey while I’ve got you on the line where’s Coda 3? Just switched to the Subscription model. I’d do this all day at $25 per year with regular updates. I’d probably do $30 or $35 if you guys bring back Transmit for iOS. Bring back Transmit for iOS. I hate all the alternatives. That subscription is valid only for Transmit 5? What about Transmit 6 when it will be released? I loved the last FAQ. But I am not pretentious. No coda 3:)). Where is Coda Dark Mode for Mojave :)))?! Yea I know, soon :)). I am pulling your leg here. Good job on all counts guys. I’ve already bought Transmit 5, so I won’t be purchasing the Mac App Store version, but if you’re using this subscription as a test-bed for cracking the iOS revenue nut you can count on me! I second Charles Russell. I’m thrilled to see the subscription Mac App Store move, in part because it’s a great path for reviving the iOS app. I would easily pay double the Mac subscription price for an iOS version. With the new iPad Pros and a probable laptop-level software upgrade with iOS 13, it seems to make more sense now than ever. Subscriptions are doing great! But don’t worry, you can still buy our apps from panic.com. All Panic apps are now subscription only. I think you guys are great and I wish you the best of luck as a company. But I’m honestly hoping that his experiment fails because, on principle, I don’t think I will ever be comfortable with software subscriptions for standalone apps. Will subscriptions carry over to Transmit 6+? @simon Yes, subscribers will get any major updates automatically. Is Transmit Disk in the version I can buy directly from you? I will do the subscription model too if i upgrade to Mojave in 2-3 months. And i hope Coda 3 will go the same way and i can subscribe it in the Mac App Store than. I hope a lot of people like the subscription model like me…. so Panic could have a good life and can develop good macOS Apps – all under the house of the Mac App Store. It’s all good for us. Coda 3 will apparently be released next year according to a tweet I made I wouldn’t mind a subscription model if I was freely able to update to coda 4 etc in the future without a change in price or at least let us know. I hope Coda doesn’t go the subscription route. I bought Coda 2 in May of 2012 for $99. It’s almost 2019 with no Coda 3 release anywhere in sight. If Coda switched to subscription for approximately half the full cost similar to Transmit, I would have paid $350 for the same application. Coda has really fallen behind compared to newer editors. I bought a license for my personal work, but also required my previous and current employer to buy a license for me because I consider it one of my essential apps for doing work. It’s becoming a hard sell now when our IT department doesn’t understand why they’re buying a license for an old program when the rest of our developers are using VS Code and it’s free. A lot of this could be more manageable if there was an active Plugin library. Every 6 months or so, I go to the plugin page to see that nothing is new. Also, I find Coda to be terribly slow with larger minified files. If I need to search a minified file, forget about it. It takes too long for it to even finish with syntax highlighting. I always have to open the file with VS Code, do anything I need to do, then quit. Sorry, I know I’m just ranting. I see Panic as innovators. I buy apps they make because I know that somehow, I can incorporate that app into my workflow. Unfortunately, sometimes those things get killed off (I’m looking at you, Status Board and iOS Transmit), and sometimes things feel neglected while others are getting more attention. You guys don’t make it easy for us Coda users. I feel like anyone still using Coda is mainly due to the loyalty they have for the panic team. I’m still behind you all but the landscape has changed drastically and there’s soooo many reasons to switch. Some simple updates would be greatly appreciated. Even just a forecast of what you vision for the product is would be awesome. Any kind of eta on a Coda update would be great. It really feels like it’s dying on the vine, and whenever I go into a new shop, I’m always having to defend my usage of Coda. I use it both on the Mac and the iPad, and that’s really my only solid defense. I have to say, I’m honestly starting to rethink my support of Coda at this point, because it seems ya’ll have lost your direction and want to be a gaming company or something… I dunno. I hope I’m wrong, but I’m getting tired of checking this site to find that nothing has happened. Some more info on Coda 3 would be much appreciated, especially for us loyalists. I don’t have the same fears that other posters have (you’ve made it clear that Coda 3 is coming), but as the others have said, it’s been a while and there’s no indication of what there is to look forward to. There aren’t good options for a top quality, true Mac editor and Coda is pretty much it which has been fine as it’s got the Panic level of quality. I happily bought Coda 2 as soon as it launched and it is indeed long in the tooth now. Any information at all that you can share about Coda 3 would be well received. I stopped using Coda long ago in favor of other alternatives because it just wasn’t being updated enough. Sorry Panic. Even (dare I say it) Dreamweaver has better features than Coda now.